Bosebuck Mountain Camps is at the center of a 200,000 acre wilderness with gated access to another 26,000 acre parcel. This pristine acreage provides prime habitat for wildlife and yielding an excellent population of birds, deer, moose and bear. We can secure skilled guides for you (with or without dogs for bird hunters) and we are a Licensing Agent and Big Game Registration Station for the Maine Department of Inland Fisheries & Wildlife. Now our lodging guests or local sportsmen can purchase a license or tag their deer, bear, or yes, even a turkey right here at camp. Since Bosebuck Mountain Camps is located just 3 miles from the New Hampshire border, it offers double the options available to our hunters. 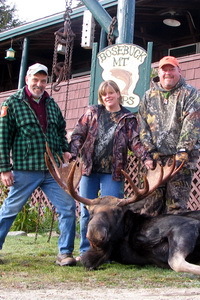 We have guides on staff that are registered in both Maine and New Hampshire who are more than willing to provide their expertise to enhance your hunting experience. In addition to our staff, we can also secure the services of local guides who have grown-up in the area and have traversed every nook and cranny of these mountains.